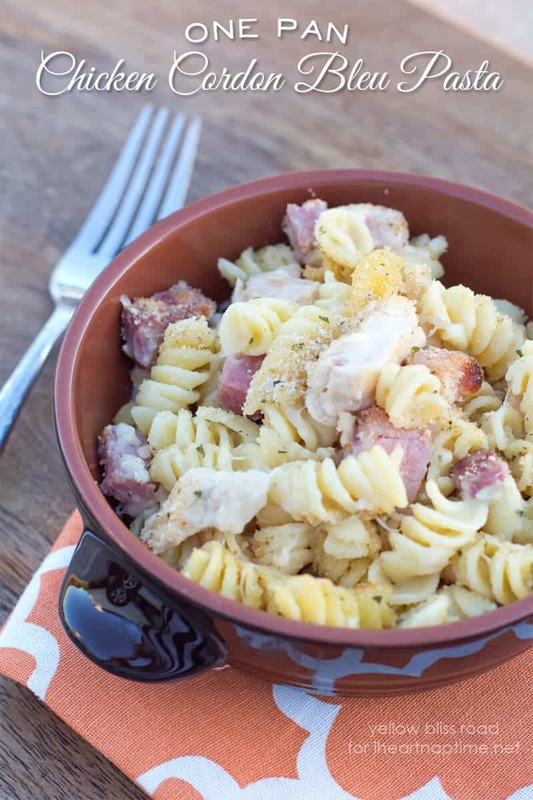 One Pan Chicken Cordon Bleu Pasta by Kristin of Yellow Bliss Road. 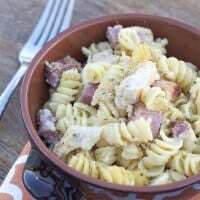 Tender chunks of ham and chicken combined with flavorful Swiss cheese make this One Pan Chicken Cordon Bleu Pasta a truly spectacular meal. One Pan meals, like my Cheesy Smoked Sausage Pasta, are a staple in our home. As a single parent with two busy kids, I’m always looking for ways to get dinner on the table quickly and with as little mess as possible – my kids make enough of a mess on their own! So one pan meals are a great way to cut down on dishes and save my sanity. This Chicken Cordon Bleu Pasta is about as easy as they come. 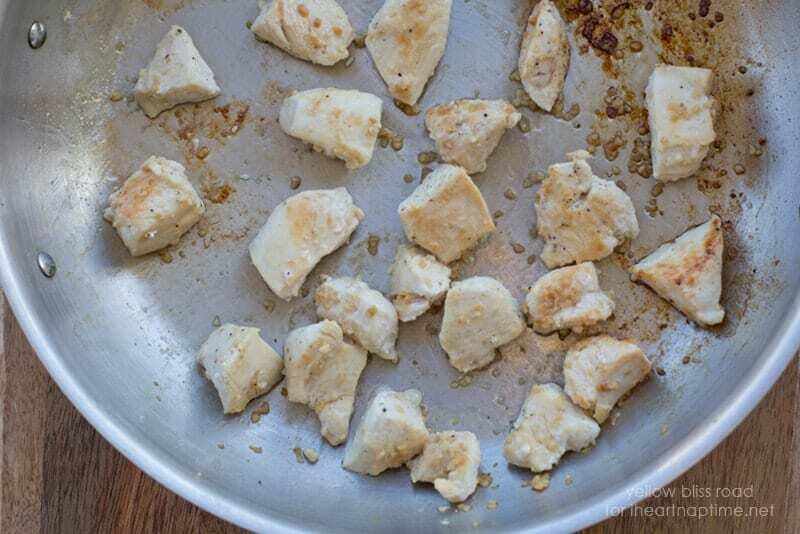 Start by heating some olive oil in a 12″, oven-safe skillet, then add garlic and diced chicken breast. You’re just searing the chicken, not cooking it all the way through. 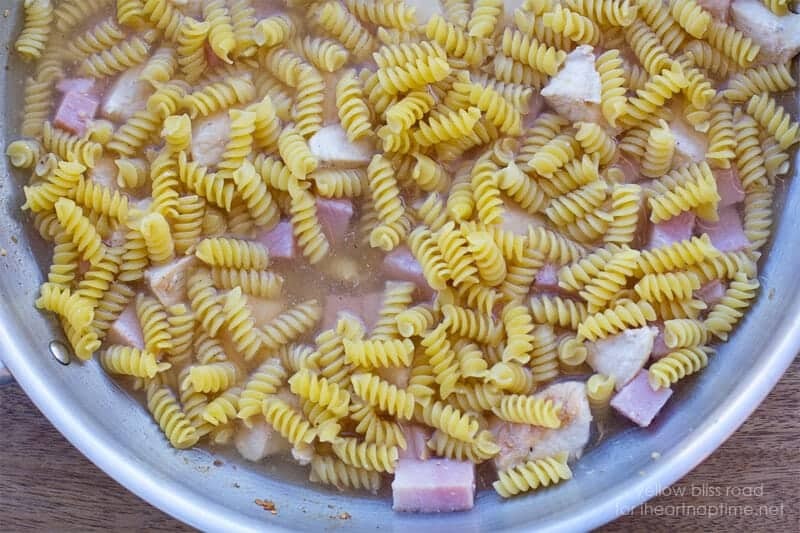 Next you’ll add the cooked and diced ham, dry pasta, water, garlic powder, onion powder, dry mustard, salt and pepper. Stir it up to combine the flavors and bring it to a boil. The type of pasta isn’t important, as long as it’s small. I love the way cheeses cling to the Rotini (spiral noodles), so that’s usually my pasta of choice for one pan meals. Once the water is boiling, cover the pan and reduce the heat to low. Set your timer for 20 minutes and walk away. See? I told you it was easy! Now comes the fun part – the CHEESE! Cheese makes everything better, right? 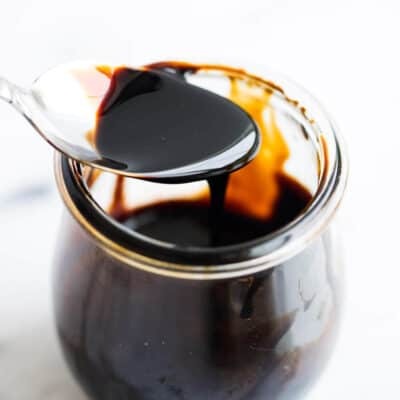 There will be liquid left in the pan but that’s ok – you need that to help make the sauce. If you’re a garlic lover like me, you can add another teaspoon of minced garlic here, but it’s optional. Toss some sliced or shredded Swiss Cheese in the pan and stir it up really well until all the cheese is melted. Sprinkle breadcrumbs on top and place the pan under the broiler for about five minutes. If you loved this pasta dish, you’ll love the 35 Delicious Pasta Recipes that I’m sharing today! 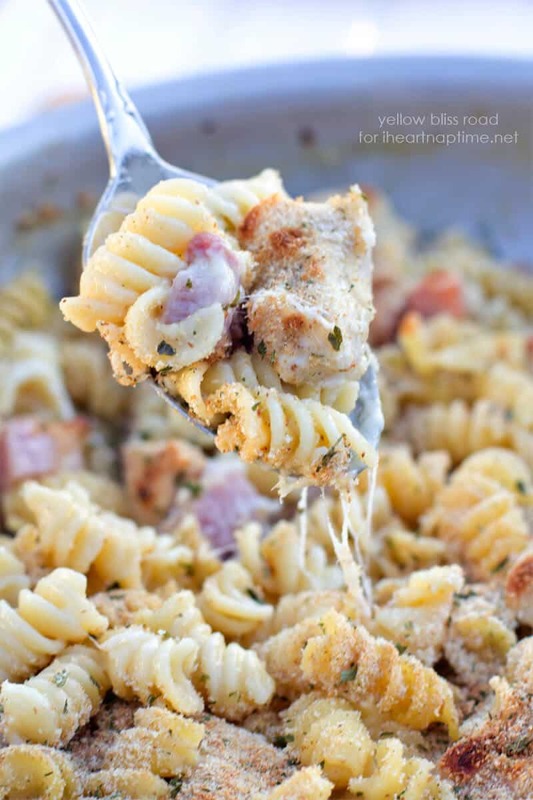 A deliciously cheesy pan pasta with savory ham and chicken, topped with breadcrumbs. Heat olive oil over medium heat in a 12″ skillet. Add garlic and cook for about 30 seconds, then add the chicken. Saute for a couple of minutes just until browned, but not cooked through. Add diced ham, pasta, water, salt and pepper, and garlic, onion and mustard powders. Stir and bring to a boil. Reduce heat to low, cover and simmer for 20 minutes. Remove pan from heat (there will still be liquid in the pan) and add Swiss cheese, stirring until completely melted. Top with breadcrumb mixture and place under the broiler for about five minutes, careful not to let it burn. 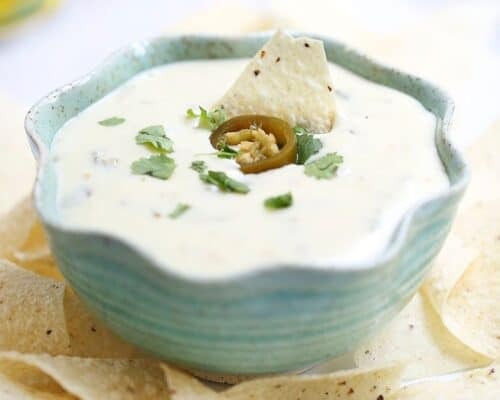 My kids are kinda picky eaters…I made this simple recipe and they absolutely loved it. Pasta dishes are usually one thing I can get them to eat. They love Alfredo, I usually get take out on that one. I would love to hear if you have an Alfredo recipe that I could give a try. Made this last night and loved it- my husband had two giant bowls. I didn’t have any dried parsley so I did seasoned breadcrumbs instead which just added even more flavor. 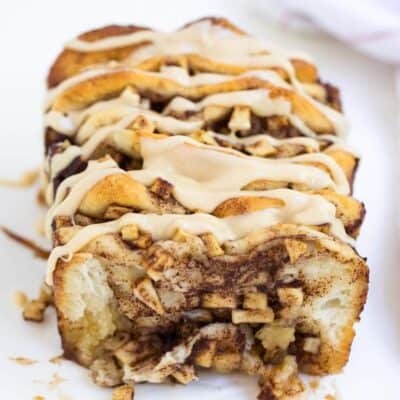 Easy, delicious recipe. Thank you! Just wondering how many adults this will serve? 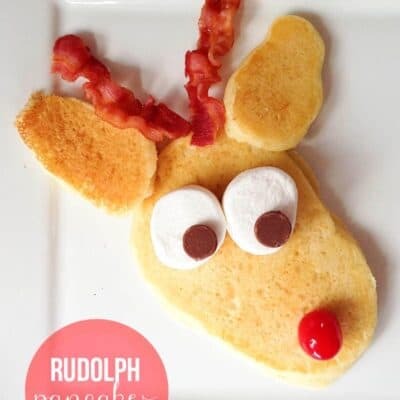 Made this the other night….DELISH! Just made this with honey ham and left over roast chicken and used tastefully simple garlic garlic seasoning. Definitely a keeper! Yum! So glad you liked it! 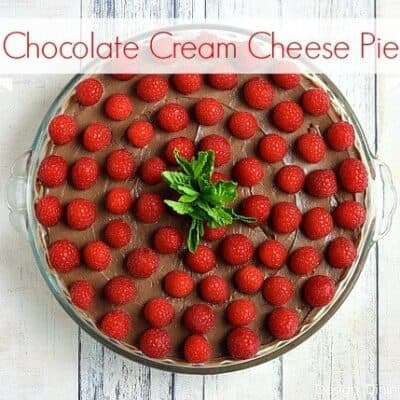 I love this casserole, and my family does too. Thanks for sharing it! One pan meals are the best! 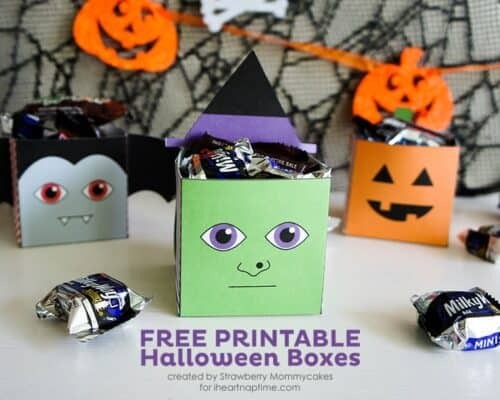 I will definitely be trying this!